There seems to be a significant discrepancy in the adoption of cloud applications across various companies, countries and continents. Companies based in the European continent are reluctant to accept cloud computing wholeheartedly whereas US-based companies go an extra mile to put their core applications on the cloud. In this article, we will study this global discrepancy for adopting cloud based application. 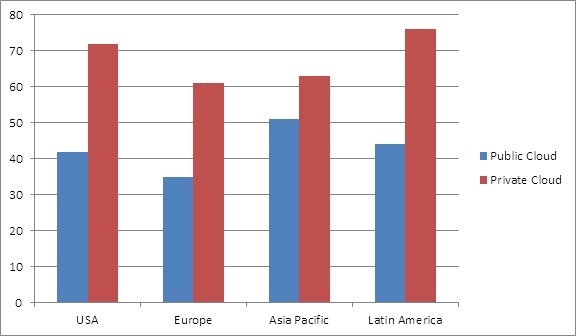 The following graph (Graph 1) shows us that Latin America leads the way by putting almost 80% of their core applications in the private cloud and 30% in public cloud. USA closely follows the mark with more than 65% private cloud based applications but it is clear that they are still hesitant to put their data on the public cloud. The region that is not conservative about adopting the public cloud is Asia Pacific with a staggering 41% ratio. 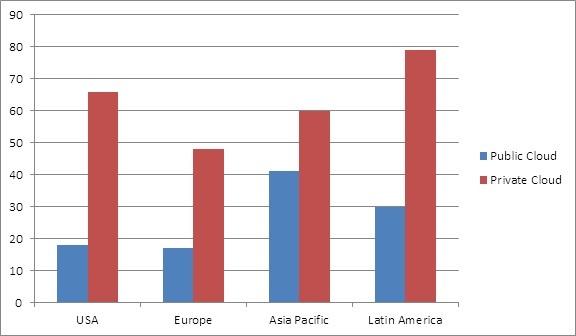 This chart represents the changing attitudes of cloud adoption in various regions across the globe. It seems that while companies have no reluctance for private cloud, public cloud has still not attained global popularity. Cloud application development over public cloud are less expensive compared to private clouds. Hence many small companies that are not very particular about security do not hesitate to put their core applications in the public cloud. It is also seen that many big companies are casting aside their doubts and fears about data security and responding more positively to the cloud. However, it is still too early to claim that public cloud will replace private cloud in the near future. Many large enterprises and IT executives still stick to the use of core applications hosted on private clouds. The following graph (Graph 2) clearly represents that there is not a major discrepancy in hosting non-core applications on private and public cloud. All the countries have shown eagerness as well as readiness to adopt non-core cloud applications irrespective of where they are hosted. Non-core applications are those applications that are needed to keep the business running but they don’t give any financial or competitive edge. More than half of the respondents across the globe agreed they would consider putting their non-core functions on the private cloud whereas more than 35 percent agreed to put them on a public cloud. This deviation from non-core to core application adoption shows that while major companies recognize the benefits of cloud app development, they are still hesitant to adopt them because of security issue. If the cloud application development companies work on these security issues, we may see more and more companies shifting towards cloud apps. We understand this need and work relentlessly to offer enhanced cloud solutions. 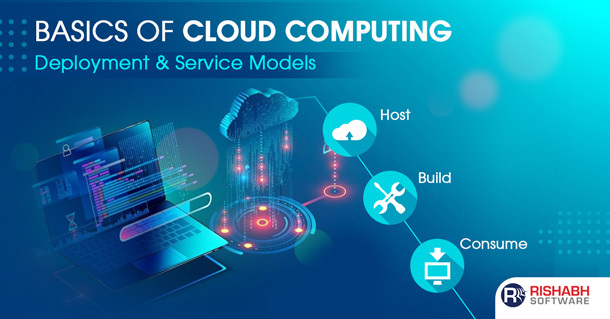 If you want to adopt cloud applications in your company, call 1-877-RISHABH (1-877-747-4224) or fill in the contact form.